Thanks for listening and sharing the podcast! Enjoy this episode and please check out the companion Blog Post. 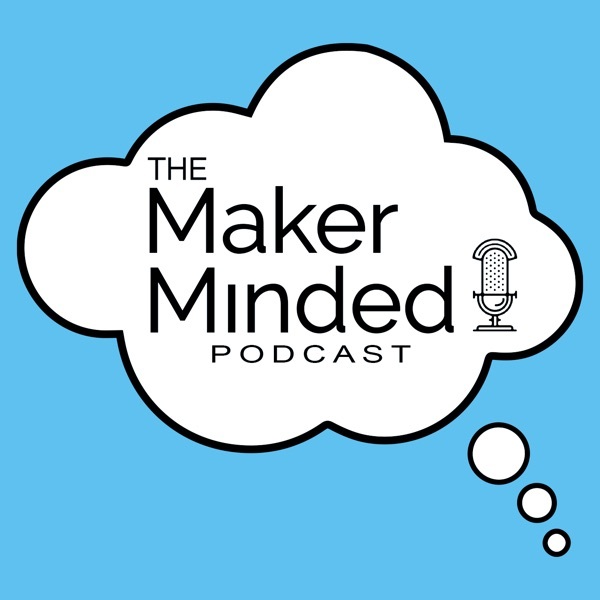 This week on Maker Minded I chat with our old friend Matt Cremona about sawmills, logging and the rebranding of this show. Make sure to check out the companion Blog Post for this episode. Stevie, from Built By Stevie is an exciting furniture builder from Nashville running an all-female crew while building some of the nicest furniture you've ever seen. Listen in as we find out the whole story behind Stevie and her furniture. Be sure to check out the companion Blog Post to this episode. It includes links and info from Stevie and everyone mentioned in this episode. Episode 087 features the incredibly talented Zack Herberholz from ZH Fabrication. Zac is a true craftsman and video maker posting sweet builds on YouTube. Don't miss this episode or the companion Blog Post. Keith Johnson from Keith Johnson Custom Woodworking is this weeks guest. Keith is a full time employee with a serious weekend furniture and woodworking problem. In this episode Keith talks about family time and how he handle the expense of some very nice tools. After listening to this episode head over to the Blog Post to find all the links for Keith and others mentioned in Episode 066. Jory Brigham is a custom furniture designer and teacher from Paso Robles, CA. He chats with me this week about design, teaching, and CNC machines. Head over to TGWPodcast.com and check out the blog post on this episode for all the links and contact info pertaining to this episode. Jonathan Katz-Moses is episode 062 guest. Creator of the Katz-Moses dovetail jig and woodworker, Jonathan is a full time YouTube creator and maker giving back to the community he loves. Be sure to check out my latest blog post on this episode where you can find out my thoughts as well as all the links to Jonathan and everyone mentioned in this episode. Mike Farrington is a full time, custom furniture builder in Denver. Mike's also a YouTuber knocking it out the park with views. Listen in today as I learn more about Mike and where he came from on episode 057 of The Green Woodworker Podcast. Be sure to check out my blog post to learn more about Mike and where you can find him. Alec Steele is one of YouTubes leading blacksmith/content creators and he's on today's episode. At just 20 years old, Alec has done quite a bit with his blacksmithing career. Check out my blog post to find out more. Be sure to leave a comment on my blog post or iTunes or both for a chance at a cool Alec Steele tee! This week on The Green Woodworker Podcast I have the pleasure of sharing my 50th episode with Jimmy Diresta. Jimmy is an incredible asset to the maker community and is loved by many including myself. Please head over to TGWPodcast.com and check out my blog post about this episode. Leave a comment and be entered in a giveaway for some cool stuff from Jimmy. This week on The Green Woodworker Podcast, I have the pleasure of chatting with Jenn from 7MileDesign.biz and JustBringIce.com. Jenn is a full time employee and side business owner staying busy with custom orders and a new food blog. Check out the full story on our blog at TGWPodcast.com. If you want to keep up with the podcast, check us out on Instagram, Facebook, and Twitter If you'd like to support the podcast by grabbing a sweet tee, send me a message here! You can also help support the podcast by becoming a patron over on Patreon.com. Thanks for all the support everyone! This week on The Green Woodworker Podcast Episode048, I have the great pleasure of chatting with the awesome Birkey! Andy Birkey that is!! Andy is a YouTuber, maker, and all around builder of awesome things. Andy has a very unique story and his work is even more unique. Specializing in antique church restoration, Andy has done some amazing work around the world. Listen in today as Andy tells us some of the awesome things he's done on The Green Woodworker Podcast. Be sure to check Andy out on YouTube, Facebook, Instagram, Twitter, and read his feature tip in Make magazine. Here are the folks Andy and I mentioned in today's episode. Jimmy DiResta, Izzy Swan, Shaper Origin, David Waelder, Paul Jackman, Giaco, Laura Kampf, Kyle Toth, April Wilkerson, Tim Sway This week's featured maker is Brian from DeJong Wood Creations. Please give him a follow on Instagram. If you want to keep up with the podcast, check us out on Instagram, Facebook, and Twitter If you'd like to support the podcast by grabbing a sweet tee, send me a message here! You can also help support the podcast by becoming a patron over on Patreon.com. Thanks for all the support everyone! This week on The Green Woodworker Podcast episode 047, I am excited to chat with Joseph from OutoFTheWoods.works. Joseph is a fairly new, but incredible furniture maker. Joseph is very knowledgeable in wood, wood drying, and epoxy inlay. Joseph also has lots of info about chainsaw mills. Listen in today as Joseph talks about how he started and why he continues to push his designs today on The Green Woodworker Podcast. Be sure to check Joseph out at OutOfTheWoods.works, on Instagram, and Facebook. If you're in the Toronto area March 28th to April 1st 2018, be sure to say hello to Joseph at the One Of A Kind Show at the Enercare Centre! Also check out all the folks we mentioned on today's episode. Legacy Lumber, Canadian Woodworks, Greg Klassen Furniture, Rubio Monocoat, Alec Steele, Sawdust Junkies Check out this weeks featured maker, Brandon Walker, WalkerWoodworks.org, and on Instagram If you want to keep up with the podcast, check us out on Instagram, Facebook, and Twitter If you'd like to support the podcast by grabbing a sweet tee, send me a message here! You can also help support the podcast by becoming a patron over on Patreon.com. Thanks for all the support everyone! This week on The Green Woodworker Podcast, I chat with Zach Manring from SouthernGingerWorkshop.com and from SouthernWoodworkers.com. Zach, a military kid lived all over landing in Atlanta, GA. Zach's a very talented maker and graphic artist sharing his work on YouTube. Zach recently started the Southern Woodworkers group on Facebook and it's grown like crazy. Listen in today as Zach tells us about all the things going on in his world on The Green Woodworker Podcast episode 046. Be sure to follow and subscribe to Zach on Instagram, Facebook, and YouTube. If you're interested in the Southern Woodworkers, check them out on Facebook. Also check out some of the folks Zack and I mentioned in today's episode. Jimmy DiResta, TenSpeedTears, WorkBenchCon Do me a favor and follow this weeks featured maker, Taylor Hubbell, on Instagram. If you want to keep up with the podcast, check us out on Instagram, Facebook, and Twitter If you'd like to support the podcast by grabbing a sweet tee, send me a message here! You can also help support the podcast by becoming a patron over on Patreon.com. Thanks for all the support everyone! This week on The Green Woodworker Podcast, I have a great time chatting with Chad Grosklags from MancraftingTM.com. Chad is an incredible maker working in powder coating,laser engraving, and woodturning. Chad has 280 information filled videos on his YouTube channel. He's a full time business owner, husband, and father. Listen in today as Chad tells us how he manages all the great things he has going on in his life today on The Green Woodworker Podcast. Be sure to follow and subscribe to Chad on YouTube, Instagram, Facebook, and Twitter. Check out the folks Chad mentioned in today's episode. NYC CNC, Heath Knuckles, Alex krause, Tableft Workshop, Southern Woodworkers, NVWoodwerks This weeks "featured maker" is Nate from Ultimate.Maker on Instagram and YouTube. Please give him a follow and subscribe! If you want to keep up with the podcast, check us out on Instagram, Facebook, and Twitter If you'd like to support the podcast by grabbing a sweet tee, send me a message here! You can also help support the podcast by becoming a patron over on Patreon.com. Thanks for all the support everyone! This week on The Green Woodworker Podcast, I get to chat with Jay Bates of Jay's Custom Creations. Jay's a pioneer in the content creating community and a great guy that loves sharing information through his YouTube channel and Website. Listen in today and hear how Jay went from being a maintenance man to a full time content creator on The Green Woodworker Podcast. Be sure to visit Jay on Instagram, Facebook, YouTube, Twitter, his second YouTube channel, and at Jay'sCustomCreations.com today! Also, check out Jay's racing buddy 6sixty2racing on YouTube Thanks to all our patrons on Patreon! If you'd like to help support the show with a monthly or one time donation, please head to Patreon today. It's greatly appreciated! You can visit the podcast and sign up for our newsletter at TGWPodcast.com and follow us on Instagram, Facebook, and Twitter. This week on The Green Woodworker Podcast, I bring back Matt Plumlee from GotWoodWorkshop.com to share how he sells on Etsy. Matt has had great success selling on Etsy and tells up step by step what to do, to get going on Etsy. Matt has also written a blog post (check it out here) in conjunction with the podcast episode. I learned a ton talking with Matt, and I'm sure you will to. Listen along today as Matt shares on The Green Woodworker Podcast! Remember to visit TGWPodcast.com and sign up for our email newsletter to get email only content including video tips. If you like what we're doing and want to help support us. Head over to Patreon.com and become part of our podcast support team! Make sure to check out this weeks "Featured Maker", Dave Kunkle from WildsideWoodworking.com. Also check him out on Instagram and Facebook. This week on The Green Woodworker Podcast, I have the pleasure of chatting with Tamar from 3x3Custom.com. Tamar is fairly new to woodworking but has drawn a nice following on Instagram and YouTube. Tamar's videos are excellent as she shares her tips and mistakes along the way. Tamar is a wife and mother who's making her dreams come true as a maker and builder. Listen in today as Tamar tells us how she does it on The Green Woodworker Podcast. Be sure to check Tamar out on Instagram, YouTube, Facebook, and 3x3Custom.com Also check out this weeks featured maker, Silo Woodworks on Instagram and Facebook If you like what you've heard and want to support the podcast, you can leave a 5 star review on iTunes, purchase a TGWPodcast Tee, or be come a patron over on Patreon.com Be sure to follow the podcast on Instagram, Facebook, and Twitter As always, thanks so much for listening and for the support! This week on The Green Woodworker Podcast, I have the pleasure of chatting with Jesse Mullen of Mullen Woodworks. Be sure to check out the companion Blog Post for all the links and info from this episode. This week on The Green Woodworker Podcast, I chat with Gwen from My Sweet Relish on Instagram. Gwen is a hard working energetic lady that makes some beautiful signs and artwork. She's a mom and a full time employee running a successful side business. She tells us about a recent fire that changed life for a while and how she manages to be many things at once. Listen in today as we hear Gwen's story on The Green Woodworker Podcast! You can visit Gwen on Instagram, Etsy, and Facebook. Also check out the folks Gwen mentioned on the podcast. Scared Cinder, Jericho Home, Sawdust Junkies Please check out this weeks featured maker, JRGWoodworking.com and Instagram Don't forget to give us a follow on Instagram, Facebook, and Twitter. If you'd like to support the podcast you can grab a sweet tee or become a patron over on Patreon.com You can also share this podcast with all your friends and family. That helps a lot! Thanks for listening everyone! This week on The Green Woodworker Podcast, I have the pleasure of chatting with Rob from StoneCityWoodworks.ca. Rob is a full time furniture builder in Ontario Canada. He recently steeped up his game by moving from a two car garage into an 1100 square foot commercial space. Rob is an incredible builder that has commented himself 100 percent to being a self employed through hard work and family sacrifices. Listen in today as Rob shares where he started and how he got there on The Green Woodworker Podcast. Be sure to visit Rob on Instagram, Facebook, Twitter, and check out his site, StoneCityWoodworks.ca for your next furniture piece! Also check out the folks Rob mentioned on today's episode like Jay Bates, Ryan MacDonald, Pete Dettorre, John Malecki, IsoTunes.com, Mark Rason, LighthouseWood, BeachtodesertWoodworking, MrFixItDIY Don't forget this weeks featured maker, handcrafted_by_auns on Instagram. Please head over and give them a follow! If you want to keep up with the podcast, check us out on Instagram, Facebook, and Twitter If you'd like to support the podcast by grabbing a sweet tee, send me a message here! You can also help support the podcast by becoming a patron over on Patreon.com. Thanks for all the support everyone! This week on The Green Wood Worker Podcast I have the pleasure of chatting with one of my woodworking/making/building heros, Mr. Izzy Swan! Izzy is an incredible asset to the maker community.Be sure to check out the companion Blog Post for all links and more today! This week on The Green Woodworker Podcast I have the pleasure of chatting with my good buddy Jamie Page. Be sure to check out the companion Blog Post for links and more info on Jamie. This week on The Green Wood Worker Podcast I have the pleasure of chatting with one of my woodworking/making/building heros, Mr. Izzy Swan! Izzy is an incredible asset to the maker community. From his early years hanging out on the construction sites where his father worked, to a massive production shop dubbed as a maker space near his home town. We learn many things about the awesome Izzy Swan on today's episode of The Green Woodworker Podcast. Definitely a do not miss! You can find is at IzzySwan.com and on Youtube, Instagram, Facebook, and his podcast. This Weeks Featured Maker is Christopher Dean from TheTimberedWolf.com and on Instagram. You can also find him on Facebook. If you want to keep up with the podcast, check us out on Instagram, Facebook, and Twitter If you'd like to support the podcast by grabbing a sweet tee, send me a message here! You can also help support the podcast by becoming a patron over on Patreon.com. Thanks for all the support everyone! This week on The Green Woodworker Podcast, I have the pleasure of chatting with Rob Rein from GingerWoodworks.com. Rob is a full time social worker with a passion for his faith and his family! Rob loves to involve his children in the shop and uses their desire to learn as fuel to keep building. Listen in today as Rob tells his story and also shares some of his ideas and passions on The Green Woodworker Podcast. Be sure to check Rob out on Instagram, Facebook, YouTube, and at GingerWoodworks.com Rob mentioned some great people on this episode, so be sure to check out GatorFinishing, Pete Dettorre, Zach Manring, Lazy Guy DIY, Ridgid Power Tools, and MidWestern_Carpentry. You can learn more about The Green Woodworker Podcast at TGWPodcast.com, and follow us on Instagram, Facebook, and Twitter. If you'd like to support the podcast by snagging a cool tee, go here! If you'd like to support us monthly and become a patron, head over to Patreon.com Thanks everyone for the support! It's truly appreciated! Once you are introduced to Matt you will see the gifted abilities he has for his passion. Matt shares his knowledge with the maker community through an entertaining and informative YouTube channel and other platforms. Get to know Matt Cremona, husband, father, urban wood master. Be sure to visit Matt at http://www.mattcremona.com/ where you will find links to all his social media places. Also check him out weekly on http://www.woodtalkshow.com/ with Marc Spagnuolo and Shannon Rogers. Please visit www.tgwpodcast.com for access to all our episodes. While there, maybe hit the donate button and throw a few bucks our way so we can keep the lights on! Thanks for listening!